The past two decades have seen a tremendous increase in research and scholarship devoted to personal relationships. From rather scattered beginnings a recognizable and recognized field has emerged, whose strength and health is reflected in a wide array of indicators. The editors contend that while the vigor of the field is often shown in the diversity and innovation of its research, it is in the theoretical domain that they find evidence of a real coming of age. This volume provides grounds for arguing that the diversity of theorizing is particularly healthy at this point. The reader will notice that there is some diversity in terms of how much theory and research is contained in each chapter -- some are purely theoretical; others are complemented by original pieces of empirical research. The editors and contributors are from different countries -- another way in which the diversity of this book manifests itself. The variety of the frameworks presented are seen as a strength, as building on established strengths elsewhere to feed into relationship research and enhance its vitality. Each chapter makes its own contribution to thinking and research about personal relationships. As a group they add to an exciting collection that not only reflects a richness of conceptual backing, but also a wide range of usable theoretical structures. Contents: Preface. G. Levinger, Figure Versus Ground: Micro- and Macroperspectives on the Social Psychology of Personal Relationships. J. Mills, M.S. Clark, Communal and Exchange Relationships: Controversies and Research. T.L. Huston, Courtship Antecedents of Marital Satisfaction and Love. J.D. Lane, D.M. Wegner, Secret Relationships: The Back Alley to Love. H.T. Reis, Domains of Experience: Investigating Relationship Processes From Three Perspectives. D.A. Kenny, Using the Social Relations Model to Understand Relationships. K.A. Kerns, A Developmental Model of the Relations Between Mother-Child Attachment and Friendship. R. Sharabany, Continuities in the Development of Intimate Friendships: Object Relations, Interpersonal and Attachment Perspectives. K.E. Davis, L.A. Kirkpatrick, M.B. Levy, R. O'Hearn, Stalking the Elusive Love Style: Attachment Styles, Love Styles, and Relationship Development. R. Erber, A. Tesser, Self-Evaluation Maintenance: A Social Psychological Approach to Interpersonal Relationships. P.A. Dykstra, J. de Jong-Gierveld, The Theory of Mental Incongruity, With a Specific Application to Loneliness Among Widowed Men and Women. 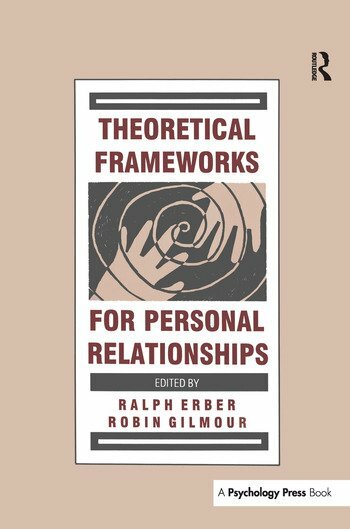 "...the reader will find an informative description of some of the major theoretical perspectives in the personal relationships field....one will come away from reading this book with a good understanding of some of the principal perspectives, along with the research pertaining to them."